Skin aging caused by systematic sun exposure, facial blemishes due to excessive pigmentation and, in general, imperfections caused by melanin are more and more common problems today……. It will only be possible to remove the anti-aesthetic skin blemishes and recover the smoothness of the skin, bringing back its luminosity, with a treatment that has a direct effect on the intimate formation process of the pigment (melanin). 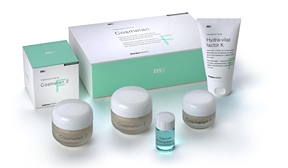 Cosmelan Depigmentation treatment is suitable for all skin types with a very high safety margin. Cosmelan Depigmentation treatment action mechanism is based on the inhibition of tyrosinase, a basic enzyme in the melanin formation process. Several of the substances present in the Cosmelan formula act by blocking this enzyme, or even by inverting the metabolic process of the transformation chain. Cosmelan Depigmentation treatment involves a very versatile, dynamic process, which is easily adapted to the needs of each individual patient. Office treatment: your physician will thoroughly cleanse the surface of the skin by removing any dead cells and oily residue. A facial mask will be applied to the patient over the surface of the skin to be treated. The time required for the cream to act completely is determined for each individual based on the patient's skin type. Home treatment: the treatment is then followed by the Cosmelan 2 cream. This guarantees the permanence of the initial depigmentation treatment, favoring the disappearance of blemishes of melanic origin. Your physician will advise you on the proper use of the Cosmelan 2 cream. Can I stop the Cosmelan treatment at any given time? No, the treatment must not be interrupted under any circumstances, during the whole time prescribed. Can I combine the Cosmelan Treatment with other treatments? Do I need to discontinue my everyday activities in order to use Cosmelan? No, Cosmelan is a very versatile product that can be incorporated into each individual life style. Can the blemishes return if I stop using Cosmelan? In order to avoid blemishes from returning, it is necessary to be disciplined with the Cosmelan regimen. On the days you do not follow the Cosmelan protocol, you should at least use a sun block.